We hope you’ve been enjoying these past few days of sun in the Northern Virginia area. The rain has hit Virginia pretty frequently this spring season and we are always excited for a few days of sun. But we are sure that the rain will come back before spring is over and probably even during the summer. Sadly, many times the rain stops us from spending time outside, or from simply hanging out on our decks. Thankfully, we have screened porches! You can always call us to install a gorgeous deck for your home, but if you are looking for something a little bit different that you can use all year-round, a screened porch is the perfect choice. 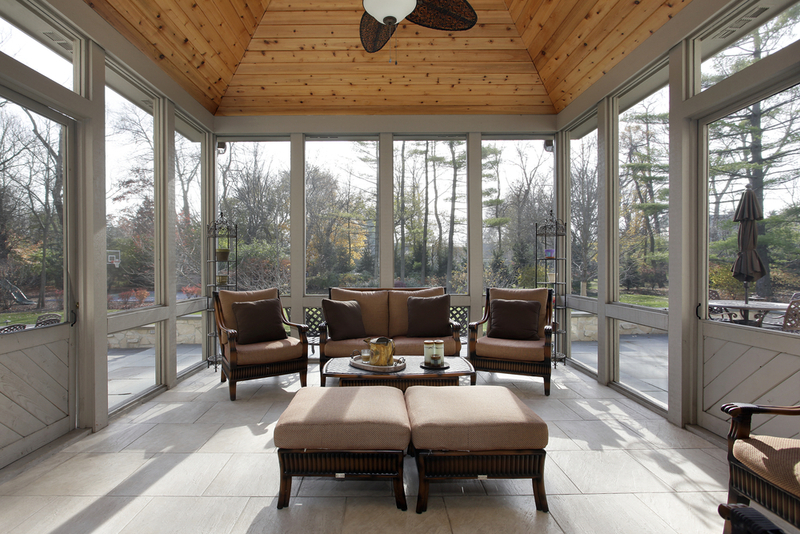 Unlike a deck, a screened porch can be use during the coldest and even the warmest days! So, if it’s cold outside and you just want to sit out and watch the snow without freezing, you can do that! But you can also enjoy your porch while it’s raining. So if you’re tired of the endless days of rain in Virginia, grab a book and sit in your porch without getting rained on! If you are anything like me, I tend to spend less time outside because I’m a mosquito magnet. But when you have a screened porch, you don’t have to worry about these annoying little fellas. You can nap, read or eat in your porch without having to fight off bugs. Although it is only a mesh screen, the screen adds more privacy to your porch. People would have to get closer to see what is going on. In addition, the screen adds a layer of protection for kids and pets! You can leave them in the porch and you can rest assure that they won’t get out unless your door is open. With this additional space added to your home, you can enjoy natural lighting without having to go outside. If your home is lacking in natural lighting, this would be a wonderful space to paint or simply relax without having to turn on the lights and waste energy. Screened porches are a wonderful option to enhance your living space. If you are ready to maximize your space, take a look at the screened porches we have installed and then give MidAtlantic Contracting a call!